Hemangiomas involving the middle ear and the mastoid are rare lesions and have been sporadically reported in the English literature. Because of their rarity, diagnosis is difficult and in most cases post-operative. , Hemangiomas have been mistaken for glomus jugulare as well as chronic otitis media in the past and explorations have been performed. , Excessive intra-operative bleeding has been reported during surgery for these lesions. 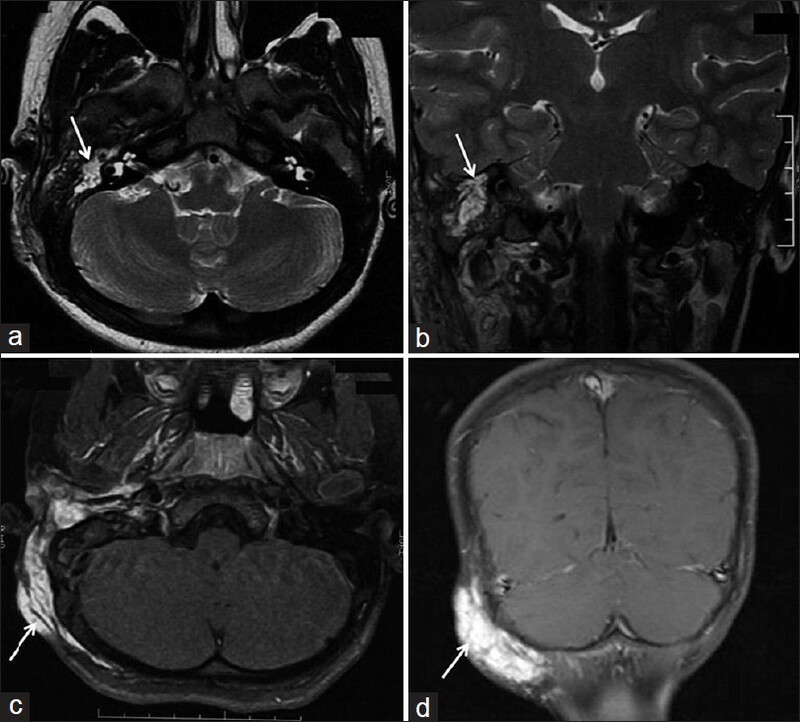 We present a case of hemangioma involving the middle ear, mastoid and petrous parts of the temporal bone extending into the retro-auricular skin which was diagnosed pre-operatively by magnetic resonance imaging (MRI) and digital subtraction angiography. Treatment was performed by a combination of trans-arterial and percutaneous embolization. To the best of our knowledge, this is the first reported case of a middle ear and mastoid hemangioma extending into the subcutaneous region thus raising the clinical suspicion for hemangioma. The lesion was subsequently prospectively diagnosed on cross sectional imaging and angiography thus allowing a minimally invasive neurointerventional management. A 10-year-old female child presented to our Otorhinolaryngology Department of our institute with the chief complaint of deviation of the angle of the mouth to the left side since 1 year [Figure 1]. The deviation was insidious in onset and gradually progressive. She also had hearing loss in her right ear and inability to shut her right eye since 1 month. Extensive enquiry in the patient's history did not reveal any cause for this focal neurological deficit. Neurological examination was performed, which confirmed the presence of a right sided lower motor neuron facial nerve palsy. No other focal neurological deficit was demonstrated. A soft compressible swelling was seen in the right posterior auricular and occipital region with erythema of the overlying skin [Figure 1]. The swelling was non-tender and non-pulsatile. Audiometry was also performed, which showed a right sided moderate conductive hearing loss. A high resolution computed tomography (CT) of the temporal bone showed complete opacification of the right middle ear and mastoid air cells by abnormal soft tissue [Figure 2]. MRI study showed a T1-hypointense and T2-hyperintense enhancing lesion in the right mastoid and petrous temporal bone and in the occipital bone extending into the soft tissues of the scalp overlying the occipital bone [Figure 3]. A diagnosis of hemangioma was made and the patient was referred to our Interventional neuroradiology division for further management. After reviewing the patient's clinical features and investigations, we thought biopsy to be unnecessary and decided to treat her using neurointerventional techniques. Under general anesthesia, right femoral arterial access was taken. Right external carotid artery (ECA) angiogram in submentovertical and Schuller's view showed an intense persistent tissue staining in the mastoid temporal bone with extension of into the petrous bone and middle ear [Figure 4]. The hemangioma was supplied by many small arterial feeder branches arising from the Right ECA branches. No arterial-venous shunting was seen. Direct puncture of the swelling was performed using 24 G Scalp vein set under aseptic precautions. After confirmation of good back flow of blood, embolization was carried out using 2 cc of 16% n-butylcyanoacrylate glue followed by 3 cc of 66% sodium tetradecyl sulphate. Post-embolization angiogram shows mild vascularity in occipital region supplied by occipital artery branches. Excelsior - 10-18 microcatheter was navigated over Transend - 14 microwire in distal position of occipital artery and embolization was then carried out using 100-200 micron polyvinyl alcohol particles. Post-embolization angiogram showed near complete resolution of the hemangioma [Figure 4]. The post-operative period was uneventful and the patient was discharged on the second post-operative day without any complications. Thereafter, the patient received regular follow-up examinations. No improvement in the right facial nerve palsy was appreciated on neurological examination in the follow-up period. However, the parents of the patient did report a slight improvement in the right facial paresis. Also, both symptomatically and on audiometric evaluation, improvement in the right sided hearing loss was seen. Hemangiomas are the most common tumor arising in infancy and frequently involve the head and neck region. 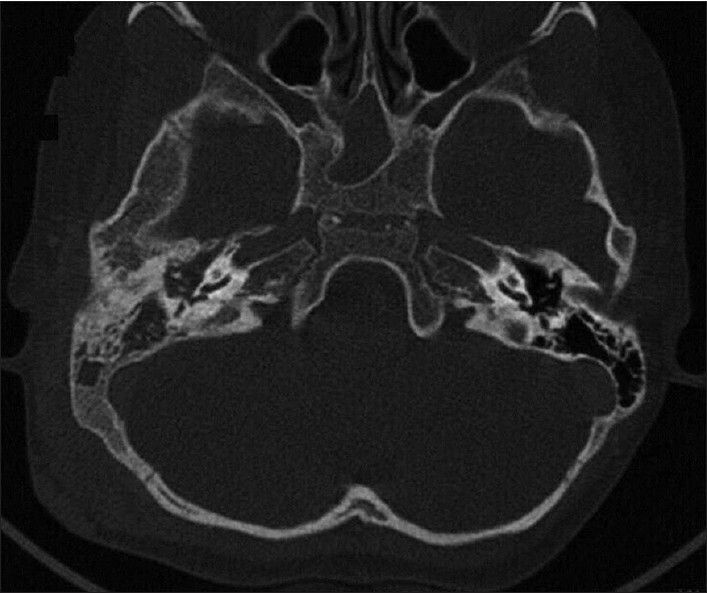 However, temporal bone hemangiomas are rare lesions and predominantly involve the geniculate ganglion and the internal acoustic canal. ,, Furthermore, uncommon sites are the middle ear, mastoid process, tympanic membrane, and the external auditory canal. , We report the first case of a hemangioma involving the petrous and mastoid temporal bone extending into the middle ear as well as into the soft tissues of the retro-auricular scalp. Hemangiomas of the temporal bone have varied clinical presentations. They may present with facial nerve palsy or sensory-neural hearing loss due to involvement of the facial and the vestibule-cochlear nerve respectively. Middle ear hemangiomas may produce tinnitus or lead to conductive hearing loss. As such, they might be confused with glomus jugulare tumors. Hemangiomas may also cause recurrent episodes of otitis media or a mass lesion in the external auditory canal. The differential diagnosis of glomus-like lesions of the middle ear is broad including variations of vasculature, tumors and inflammatory lesions. To differentiate in between these lesions it is important to consider the clinical features, examination findings and imaging investigations. Biopsy may be required in some cases to clinch the diagnosis. In our case, the temporal bone hemangioma extended into the subcutaneous tissues of the retro-auricular and the sub-occipital region forming a swelling in this region. The physical characteristics of this retro-auricular swelling such as compressibility and blanching erythema lead us to suspicion of a hemangioma which was later confirmed by CT, MRI, and angiography. Earlier, patients were advised watchful waiting in the hope of spontaneous resolution. However, now it is being increasingly realized that incomplete involution is not uncommon and the balance is shifting towards active management of hemangiomas. In the temporal bone, hemangiomas commonly give rise to functional disturbances like hearing loss and facial palsy. Aggressive management is thus justified to prevent irreversible sequelae. Most of the cases of middle ear hemangiomas reported in literature have been treated with surgical excision with or without ossicular reconstruction. ,, Kostrzewa et al. performed surgical resection of a middle ear hemangioma with the aid of a CO 2 laser. Spontaneous involution of a middle ear hemangioma has also been demonstrated in an asymptomatic infant diagnosed incidentally. In our case, the hemangioma had an extensive involvement of the temporal bone. Also, the lesion extended into the retro-auricular skin thus presenting a new window for intervention. We decided against surgical resection and performed a combined direct percutaneous and trans-arterial embolization of the hemangioma. Ours is the first case of middle ear and mastoid hemangioma treated with embolization. Embolization has been used for the treatment for hemangiomas in the past, either as the sole treatment modality or combined with post-embolization surgical resection. , In the study conducted by Jianhong et al., 17 patient with maxilla-facial hemangiomas underwent embolization either alone or followed by surgery or intralesional Bleomycin injection. The authors reported an excellent response in all the patients with marked decrease in the size of the lesions. There were no complications and no recurrences were detected during the follow-up period which ranged from 5 months to 86 months. In another study, hemangiomas of the head and neck responded dramatically to embolization with arrest of their proliferative phase and decrease in size. In our patient also, the middle ear and mastoid hemangioma responded well to embolization with a subjective improvement in the facial nerve palsy and both subjective and objective improvement in the conductive hearing loss. We suggest that embolization may be considered for the treatment of middle ear hemangiomas, when their size and vascularity preclude surgery. 1. Tabor JR. Cavernous hemangioma of the middle ear and mastoid. Laryngoscope 1965;75:673-7. 2. Miller MV. Hemangioma of the ear and mastoid process; report of two cases. Arch Otolaryngol 1949;49:535-46. 3. Buckmiller LM, Richter GT, Suen JY. Diagnosis and management of hemangiomas and vascular malformations of the head and neck. Oral Dis 2010;16:405-18. 4. Hecht DA, Jackson CG, Grundfast KM. Management of middle ear hemangiomas. Am J Otolaryngol 2001;22:362-6. 5. Hiraumi H, Miura M, Hirose T. Capillary hemangioma of the tympanic membrane. Am J Otolaryngol 2005;26:351-2. 6. Hekmatara MH. Cavernous hemangioma of the internal auditory canal. Acta Medica Iranica 1993;31:49-56. 7. Dayal VS, Lafond G, Van Nostrand AW, Holgate RC. Lesions simulating glomus tumors of the middle ear. J Otolaryngol 1983;12:175-9. 8. Kostrzewa JP, Bowman MK, Woolley AL. Middle ear hemangioma: A novel treatment for a rare problem. Int J Pediatr Otorhinolaryngol Extra 2010;5:50-2. 9. 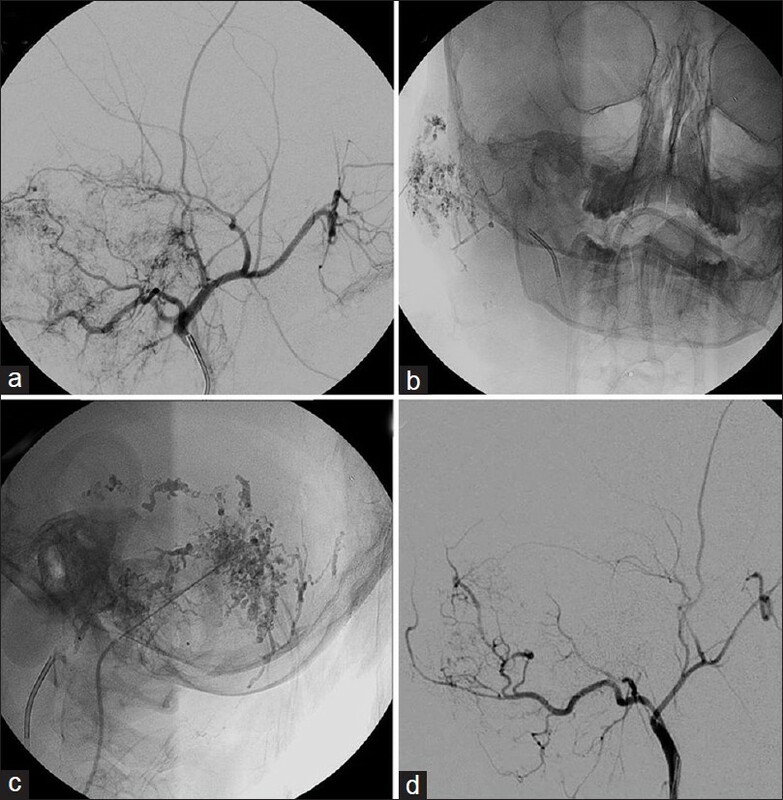 Jianhong L, Xianliang H, Xuewu J. Transcatheter arterial embolization in the treatment of extensive maxillofacial hemangioma in children. World J Surg 2005;29:1550-6. 10. Burrows PE, Lasjaunias PL, Ter Brugge KG, Flodmark O. Urgent and emergent embolization of lesions of the head and neck in children: Indications and results. Pediatrics 1987;80:386-94.